The 5th fold is a tribute to our country, for in the words of Stephen Decaur, "Our Country, in dealing with other countries, may she always be right; but it is still our country, right or wrong." The 6th fold is for where our hearts lie. It is with our hearts that, "We pledge allegiance to the flag of the United States of America, and to the Republic for which it stands, one Nation under God, indivisible, with Liberty and Justice for all." The 7th fold is a tribute to our Armed Forces, for it is throughout the Armed Forces that we protect our country and our flag against all her enemies, whether they be found within or without the boundaries of our republic. The 9th fold is a tribute to womanhood and Mothers. For it has been through their faith, their love, loyalty and devotion that the character of the men and women who have made this country great has been molded. 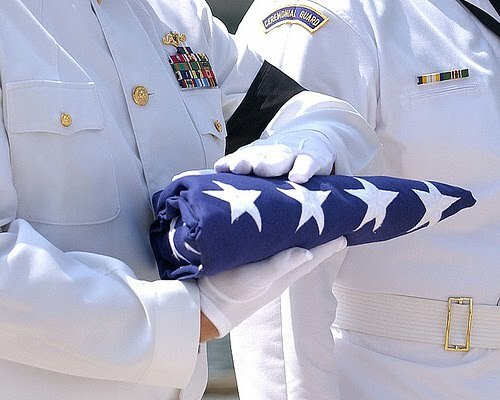 The 10th fold is a tribute to the Fathers, for they too have given their sons and daughters for the defense of our country since they were first born. The 12th fold represents an emblem of eternity and glorifies, in the Christians' eyes, God the Father, God the Son and God the Holy Spirit. It was sent in by Russell Maynard of Michigan. Government schools stopped teaching this in 1955. The flag is folded 13 times to symbolize the original 13 colonies. I have a flag folded like this in a memory box. It came to me when my husband passed away five years ago. My granddaughter's husband is serving in Iraq at present. Wow, I didn't know this. Thanks for sharing. I have my uncle's flag in a memory box. He served in Iwo Jima during WWI, and again during the Korean War. I never knew this!!! Thank you so much for sharing it with all of us...Blessings to you and your family and Happy Memorial Day! Happy Memorial Day to you. Hope you had a great weekend. That is such a beautiful picture.